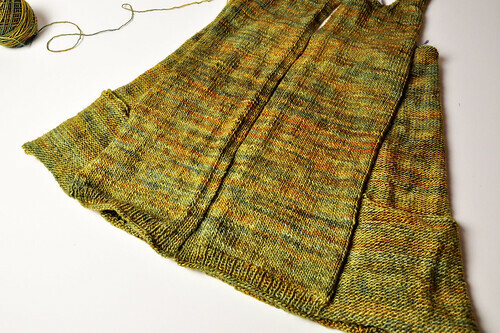 It’s time for another Knit Purl staff WIP Wednesday, in which we share our latest project progress with all of you out there in Blogland! We apologize for our radio silence last week; this writer was on a road trip to Park City, Utah, and didn’t have a chance to update. I did, however, make a ton of progress on my Hay Cardigan while on the road! It’s made with Madelinetosh Tosh Merino Light in Filigree, which is absolutely heavenly to knit with. I’m so excited to wear this sweater, especially after my last attempt at a cardigan didn’t turn out so hot. I’m determined to finish this one by the time it gets too warm outside to wear it (which at this rate will be quite a while, judging by the chilly rain today)! 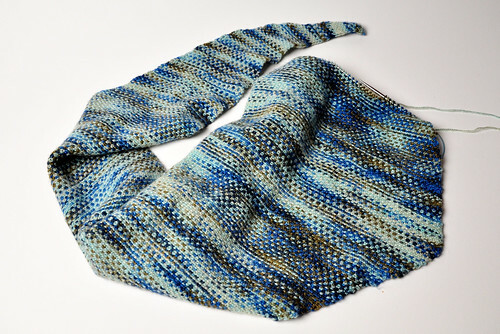 Next up is Kristin’s linen stitch bandana scarf, a pattern of her own design. A sequel to the scarf she wears frequently around the shop, Kristin is knitting this one with silky Shibui Staccato in Summer Camp. Keep an eye out for this pattern to be released by Shibui in June! 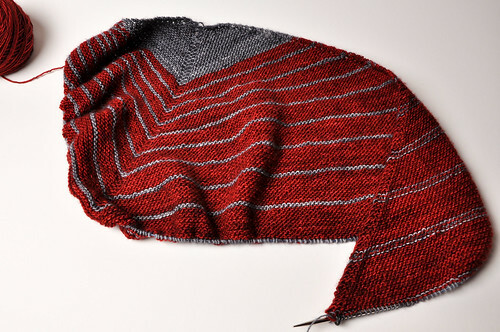 Oleya continues the Tosh Merino Light trend with her Stripe Study Shawl. The pattern has been immensely popular on Ravelry lately, but Oleya makes it her own with bold scarlet Tart and deep Charcoal. This gal can seriously pull off a good red! Last but not least, we have Lindsay’s Featherweight Cardigan, in Madelinetosh Sock in Charcoal. 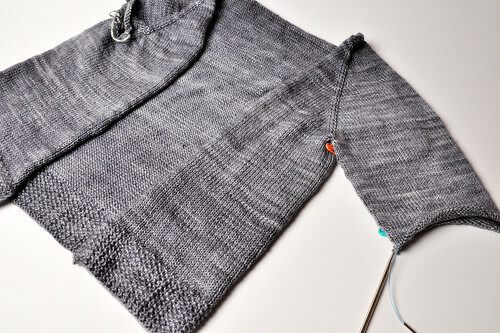 With one sleeve almost complete, Lindsay is on track to finish her first full-on sleeved garment ever! I love the unique touch of style added by the seed stitch edging she’s innovated from the original pattern. That’s all we have for today, but check back next week for more lovely projects from all of us at Knit Purl! Until then, happy knitting! The post WIP Wednesday! appeared first on Knit Purl Blog.